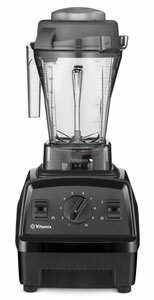 The **New for 2018-2019 The Vitamix E310 Explorian Blender is Vitamix’s lowest priced full powered blender. Here you get the Vitamix quality and power for under $350. It has a low profile design, making it easier to fit under cabinets on your countertop. The Vitamix E310 Explorian is a powerful blending machine. It has 1,380 Watts of power with a strong 2.0 HP Motor and a 5 year warranty. Vitamix machines are among the most powerful that we have reviewed and have a wonderful reputation for high quality blending machines. These type of countertop blenders are perfect for making smoothies without grit, even green smoothies with Kale and Spinach. 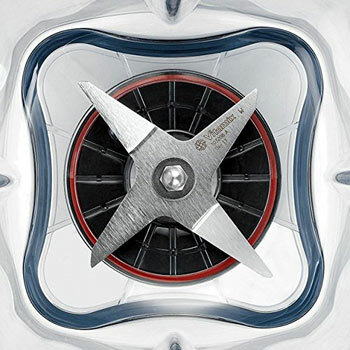 Its 4-blade stainless-steel blade can cut through frozen fruit and ice cubes. The Vitamix E310 Explorian can spin fast enough to even make hot soup. Included is a 48 ounce BPA-free plastic container for blending a variety of ingredients. It is a perfect size for family meals and entertaining. The container has markings to measure how much liquid you have put in. The Vitamix E310 Explorian features a high quality 4-inch Laser-cut, stainless-steel cutting blades to blend or mix a variety of recipes. Vitamix E310 Explorian Features: The best feature is the Variable Speed Control Dial which allows you to adjust the speed, even during the blending process, allowing you to have complete control. You also have a Pulse button for quick manual blending, or cleaning. To keep things running smoothly, the Vitamix E310 Explorian includes a radial cooling fan and thermal protection system. Smart-Review Commentary: Vitamix’s lowest priced full power blender does not skimp on quality. The Vitamix brand has an excellent reputation for some of the highest quality blenders on the market. The Vitamix E310 Explorian Series blender maintains this tradition. The E310 Explorian model is very powerful, with 1,380 watts and a 2.0 HP motor. (Garbage disposal motors are only 1/3 to 1 HP). 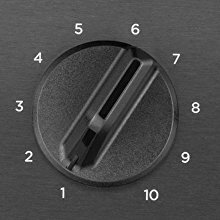 A really nice feature is the Variable Speed Control Dial, which allows you to finely tune your power while blending. To prevent premature shutdown, which can occur with powerful blenders, the Vitamix E310 Explorian has a thermal protection system with a radial cooling fan. What sets Vitamix apart from cheaper blenders is the higher quality components they use, including the 4-inch Laser-cut, stainless-steel cutting blades, and a 5 year warranty. This model has received outstanding consumer and professional reviews. Vitamix are leading blenders used in Starbucks, and fine restaurant kitchens. This model includes a Vitamix Recipe Cookbook, and tamper (for pushing ingredients down). This more affordable Vitamix model is not only a Smart-Review top pick but also won our Best of 2019 award for Blenders under $350. Description: The Explorian E310 is Vitamix’s lowest cost full size blender. Despite its lower cost, it retains full power blending with a 10 position power dial. The E310 is low profile allowing it to fit under cabinets. Great for smoothies and even hot soup. This model has received outstanding consumer reviews.